Nigel Adkins hinted that he would rethink the preferred starting line-up to cope with Stoke City’s distinct way of playing, so we found Ramirez on the bench and Rodriguez up front. Many fans expected to see Hooiveld, and he was out there too, but the precise reason why is unclear as Clyne was unavailable through injury and Yoshida moved to full back. It all went very well for most of the match, with City’s re-constructed defence in the absence of Shawcross in particularly benevolent mood. On ten minutes they allowed a teasing cross from Do Prado to fall on Lambert’s trusty right foot, but our old failings from set pieces around the left side corner flag put the game level soon after: Shotton got away from Shaw after a throw and Kenwyne Jones’s touch was just right to guide the ball home. No matter, as Huth promptly managed to clear against his own crossbar and Rodriguez was the only player in sight as the ball rebounded back into play. Not to be outdone, full back Wilkinson joined the party by deflecting Rodriguez’s shot past Begovic. Shouts of ‘where’s your famous atmosphere?’ were tempting fate, but nonetheless relevant, and Saints would surely have been singing up to the final whistle, and all the way home as well, had Do Prado been on target with his follow up after Begovic blocked Rodriguez’s shot with his leg. 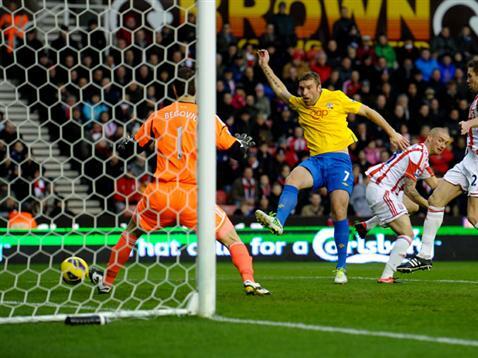 Inevitably, a goal promptly arrived at the other end when eventually Stoke’s aerial strength paid off from a corner and Upson poked the ball under Davis. Saints were given a lift when N’Zonzi was dismissed for a horrible looking, but possibly innocent, challenge on Cork, but it was hard to work out which side had the 10 men in the last twenty minutes or so as Saints visibly tired. Sending on Richardson for Puncheon as time ran out smacked of panic on the bench as well as on the pitch, and with 90 minutes up, Jerome smashed in an equaliser with the sort of shot he has hitherto only dreamed of. There was still another extremely nervy seven minutes of playing time, but Saints emerged with a point, rueing Guly’s miss while being grateful that a couple of handballs in the box hadn’t been spotted. Quite a game. LSSC Man of the Match: Jos Hooiveld, demonstrating the horses for courses adage.